Speaking to The Indian Express, shareholders who attended the AGM said many were “visibly upset” over Kochhar’s absence and sought clarity from the bank’s management over the allegations. THE MANAGEMENT of ICICI Bank faced questions on Wednesday from shareholders over allegations of conflict of interest and quid pro quo levelled against its MD and CEO Chanda Kochhar at the bank’s first annual general meeting (AGM) to be held after the charges were first raised this year. Speaking at the AGM, Sandeep Bakshi, chief operating officer of ICICI Bank, said Kochhar has not been attending office and that the bank would wait for the independent investigation report on the allegations against her before taking any action. The shareholders claimed they were instructed at the start of the meeting to refrain from asking any questions pertaining to Kochhar. “I stood up and raised slogans against the bank and corruption. I was the only one to raise slogans but I know most of the shareholders supported the cause. I asked them about sanctioning the loan to Videocon by Chanda Kochhar and Deepak Kochhar, but they just said that it was under investigation,” Suresh Thakkar, a shareholder since 1990, said. Chanda Kochhar is on leave pending an independent investigation by retired Supreme Court judge, Justice B N Srikrishna, into various allegations against her and the bank. 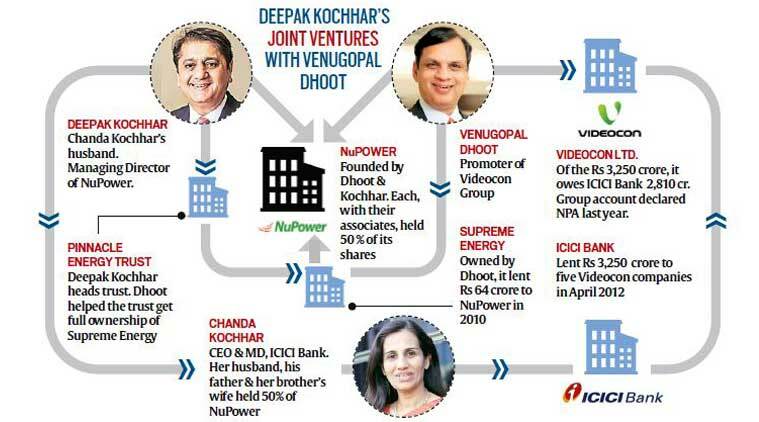 On March 29, The Indian Express reported that Videocon promoter Venugopal Dhoot provided a loan of Rs 64 crore to NuPower Renewables Pvt Ltd (NRPL), a firm he had set up with Chanda Kochhar’s husband and two relatives six months after the business group got Rs 3,250 crore as loan from ICICI Bank in 2012. Dhoot transferred proprietorship of the company to a trust owned by Deepak Kochhar for Rs 9 lakh, six months after he received the loan from ICICI Bank. The Videocon account was declared an NPA or a bad loan in 2017. The bank’s board had initially backed Chanda Kochhar. However, on May 30, while instituting an enquiry into a new complaint against her, the board said the probe will be headed by an “independent and credible person” and would be “comprehensive”. Shareholders also questioned ICICI Bank’s decision to vote in favour of the reappointment of Kochhar on the board of ICICI Securities last month. The bank holds 79.22 per cent stake in ICICI Securities. “Most shareholders raised questions pertaining to Kochhar but no answers were given. I asked how the bank could support a resolution to appoint Chanda Kochhar to the securities board. I demanded an answer as to why they couldn’t wait for three more months for the investigation to get over. This resolution in support of Kochhar has damaged the image of the institution,” Surana Ratan, another shareholder, said. In response to these queries, Bakshi said it would not be appropriate for the bank’s board to take any decision before the investigation against Kochhar is concluded. Bakshi said the bank has been cooperating with authorities on the case.